If you're visiting this page for info about the Bigger Better Bottle Bill, thanks! Just scan down this page past the cycling news. 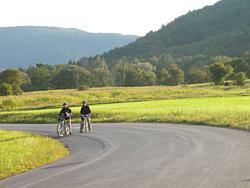 Delaware County, New York, in the foothills of the Western Catskills, is great cycling country. It's beautiful (as you see, that's an understatement) and the roads are generally in pretty nice shape, with lots of inviting bends that open up into new and lovely vistas. There's water everywhere - a brook or river along nearly every road, plus a couple of long, serpentine reservoirs for good measure. There's a refreshing lack of heavy auto traffic - the area as a whole is sparsely populated - and the air is noticeably cleaner & great-smelling. There are hills aplenty to challenge you, but flatter routes are easy enough to plan, especially around the reservoirs. 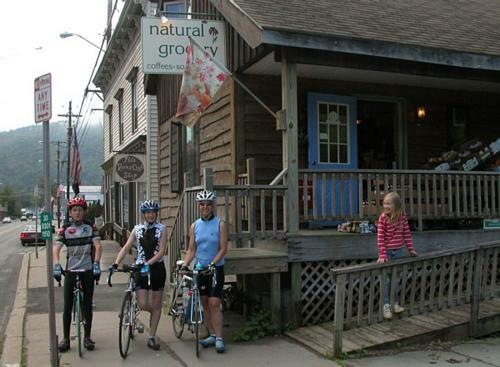 Then factor in a great little gourmet/natural foods store (that would be us) to keep you fueled, and Cinder Track Bicycles, a cycle & repair shop in nearby Livingston Manor, to keep your ride going strong and provide whatever you may have forgotten to bring. Or, heck, make their day and forget some stuff on purpose. 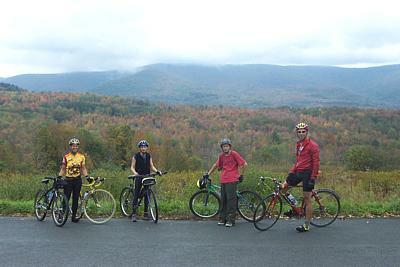 The bike shop team leads rides most summer and fall weekends. There are B&Bs in every little town, and plenty of campgrounds, both private and New York State-run, if you like roughing it. Want details? Check Cinder Track's site and/or e-mail us. Left to right, Stefan and Jesse of Pepacton Natural Foods & Virginia of Cinder Track Bicycles at the start of a June 2007 Saturday a.m. ride. Make sure to check Cinder Track's site frequently for the rides schedule. Mile 77! Left to right, Virginia of Cinder Track Bicycles, & Brian, Steve, and Thomas riding with the Sullivan County Bike Club, taking a well-deserved break on the deck at Pepacton Natural Foods, before the last leg of their 116-mile ride. August 11, 2007. Fellow cyclists always welcome! In fact, we cater to cyclists: there's always free chilled water from our Brita pitcher, bathroom facilities, plus the deck to take a break and eat your lunch or snack on, overlooking the sparkling Downs Brook flowing past. October 20, 2007 - Jesse staffs our table at LibertyBikeTrail.org's Family Bicycling Day at Walnut Mountain in Liberty. If you missed it, ya shoulda been there: it was a beautiful day - free admission, great mountain biking, amazing scenery (and FREE knock-your-socks-off organic fair trade coffee and intense, creamy organic hot chocolate donated by Pepacton Natural Foods and LibertyBikeTrail.org, respectively)! 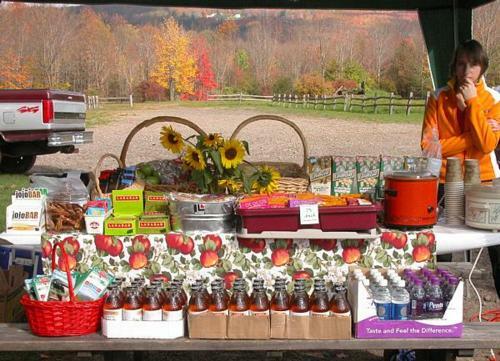 There were also hot mulled cider and lots of tasty snacks at reasonable prices to keep everyone riding hard. And Virginia & Charlie of Cinder Track Bicycles were there with bikes to rent and on-site tech help. 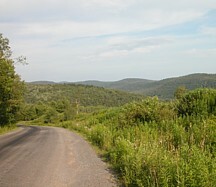 The folks at LibertyBikeTrail.org are knocking themselves out here in the Catskills to promote all kinds of cycling for everyone. Visit their site, and please set aside the day for their next event! Update on an issue close to many cyclists' hearts and in need of ongoing support: The Bigger Better Bottle Bill (see below for background). It's Spring again: Time for Action! Target date for the NYS Budget approval is April 1st, 2008! "The Bigger Better Bottle Bill is moving forward in the budget process. The Assembly has included the bottle bill expansion in their version of the budget and the new Governor is a big supporter of this legislation. In fact, he spoke out publicly in support of the Bigger Better Bottle Bill at a BBBB citizen lobby day in Albany on February 26th. "As expected, the Senate has once again excluded the bill from their budget, and the issue will be resolved during the budget negotiation process. We've been getting closer every year, and now our Senators need to hear from you about how they should support the BBBB in the budget this year. All indications are that the budget will be resolved within the next few weeks. Technically it is due April 1, but will likely take a few days or possibly weeks longer than that considering all the recent upheaval in Albany. Calling your Senator now could make a real difference on this issue. Updating New York’s Bottle Bill requires a three-way agreement between New York’s Governor, Senate, and Assembly. Governor Spitzer has proposed including the Bigger Better Bottle Bill in the 2008-09 State Budget. State legislators, especially in the State Senate, need to hear from citizens between now and April 1st, when the State Budget is supposed to be approved. Call, write or visit your State Senator and Assemblymember now and urge him or her to include the Bigger Better Bottle Bill in the 2008-09 state budget. To find out who represents you in Albany, call your county Board of Elections, or visit the Board of Elections website at: http://nymap.elections.state.ny.us/nysboe/. I urge you to update New York’s Bottle Bill to make our communities cleaner and improve recycling in New York. The Bottle Bill is New York’s most effective litter control and recycling program. However, times have changed since 1982 when the original Bottle Bill was passed, and the law needs to be updated to reflect that change. Bottled water and other non-carbonated beverages are now more visible than ever, both in our stores and in our litter. Adding a deposit would not only prevent litter, but also boost recycling. This would reduce both the volume of waste going into our landfills and the demand on energy and petroleum used to make these products. The Bigger Better Bottle Bill would also provide much needed revenue for environmental protection by requiring beverage companies to transfer unclaimed deposits to the state. This money would boost recycling and many other environmental initiatives here in New York without costing taxpayers a dime. We all share responsibility for keeping our communities clean and healthy. It is time for the State Legislature to stop ignoring strong public support for this common-sense measure and act in the best interests of the public and our environment. Please do your part by including the Bigger Better Bottle Bill in the 2008-09 state budget. I would like to know your position on this issue. Also, please send a copy of your letter to the leaders of the Senate and the Assembly. "The evidence grows stronger and stronger that New York needs an updated bottle bill. While practically non-existent a quarter-century ago when the original bottle bill was passed, non-carbonated beverage containers currently make up about 30% of the beverage market. A recent survey of litter in New York conducted by the New York Public Interest Research Group (NYPIRG) showed that these containers make up nearly 2/3 of beverage container litter, and over 1/5 of New York's total litter volume. Clearly, including these containers in our deposit system could have a significant impact on litter and boost recycling in New York. "As supporters had been hoping, Governor Spitzer once again included the Bigger Better Bottle Bill in his Executive Budget Proposal last month. The bill took largely the same form as last year, calling for expansion of the current nickel deposit system to include non-carbonated beverages such as bottled water, iced-teas, and sports drinks. The bill would also return unclaimed nickels to the state for use in the Environmental Protection Fund. It is expected that this law will generate $200,000,000 annually in environmental funding without costing taxpayers a dime! "The Assembly has been fairly supportive of this recycling and litter prevention measure in the past, while the Senate, led by Majority Leader Joseph Bruno (R-Saratoga Springs), has been the major political road block to this common-sense legislation. Facing upcoming elections and huge budget shortfalls, we are hopeful that the Senate will do the right thing this year and update our deposit system. However, they still need convincing. Please write your local Senator and Majority Leader Bruno and tell them to support the Bigger Better Bottle Bill in this year's budget." "The campaign is gearing up in preparation for the start of the legislative session in 2008. It still looks like the best chance to win on this issue is in the budget process. We are working to ensure that the bill is included in Governor Spitzer's 2008-09 executive budget proposal. Because the process starts so early in the year (proposal comes out mid-January), it is important to gain momentum now so that this issue is in the front of the minds of legislators. As in previous years, the biggest opposition stems from the Senate and majority leader Bruno. Therefore, the best thing people can do right now is to write state legislators and encourage them to pass the BBBB in the upcoming budget (especially Senators Bruno and Marcellino, but local representatives in the Senate and Assembly are important too). "Hundreds of groups and endorsers from around the state stay committed to this issue and more supporters are signing on all the time. With legislators all too aware of upcoming elections and the current dysfunction in Albany, anything can happen. We remain very optimistic about the campaign, but must stay vigilant in our efforts to let legislators know how important this issue is to New Yorkers. "Thanks so much for your support on this issue." Scan down the page for more information on how to reach those who represent you in state government, and facts you can include in your comments. "The hour for passage came and went without either house passing the bill this session. In the Senate, which has always been the trouble spot, we did see the most movement that we have ever seen, no doubt a result of the enormous pressure put on them by all the public support. But in the end it didn't amount to passage. "We really appreciate the hard work and effort that all of our citizen activists have put into this campaign, despite the rather disappointing outcome. But as usual, we plan to continue this fight until the bill is passed. It took about 10 years to get the original bill passed, so it's not over. As for next steps, we are looking to continue our outreach and build our support base. So if you know any other businesses who might be interested in becoming an endorser that would be great." Senate Majority Leader Joe Bruno blocked the BBBB from going through in the budget (he has historically been the road block), but Senator Marcellino, Chairman of the Environmental Conservation Committee, has committed to work on the BBBB outside of the budget. Governor Spitzer is still very behind it and it is still one of his top environmental priorities. Was cut from the budget because it was one of the larger issues blocking an "on time" budget, so as a result they removed it. "At this point we are still asking people to continue writing to their representative and place calls into their offices expressing support for the BBBB... I might suggest writing to Senator Bruno and Senator Marcellino expressing your support, since they are in leadership positions. Finally, we are also writing thank you letters to Governor Spitzer to express our appreciation for putting it in the budget and for still remaining behind it outside of the budget process." Want to help reduce litter, increase recycling rates, conserve landfill space, and recover money for us, the taxpayers of New York? Scan down the page for background info as well as links that will make it easy to write your legislators. Every day in the United States, 100,000,000 aluminum cans are buried in landfills. We throw out enough aluminum cans in the form of beer and soda cans to rebuild an entire commercial air fleet every three months. Extracting the raw materials to make these cans, as well as the energy used to process the raw materials, is enormous[ly energy - intensive]. Each can we recycle saves the equivalent of a cup of fossil fuel, or enough electricity to power a television for 3 hours. Recycling aluminum uses 95 percent less energy than making new aluminum. There is no limit to the number of times aluminum can be recycled. We have to wonder why we are throwing away so much money and resources. Fall 2008: with shorter hours of daylight, after-work ride season is over. See you next year! There are two methods for making plastic containers -- blow-molding and injection molding. Blow-molding produces necked bottles (shampoo bottles), while injection molding produces tubs (margarine tubs). Your recycling program may be based on the number system or on how the plastic was made. Check with your local recycling coordinator to find out which types of plastics are recyclable in your community. Please be sure to recycle only those plastics collected in your recycling program! Best option: R E D U C E ! Buy a good reusable bottle & refill it from your tap or filter pitcher. Don't buy products that utilize single-use plastics, e.g. microwaveable meals. Use your own bowl instead. When choosing among similar products, favor the one that uses the least packaging. Bring your own bags to stores. I love to ride my bikes - bicycles, that is. And I hate litter. In fact, I really hate litter. So last night, when I found out that Governor Eliot Spitzer is trying to get an expanded version of New York's Bottle Bill into this year's budget, I wrote the following. Read it if you want; more important, read down through the NYPIRG (New York Public Interest Research Group) alert. They've included some great links that make it really easy to let the legislators know that we want - no, need - clean roadsides and less pointless waste in our dwindling landfill space. And that to make the difference, all it takes is a nickel - that is to say, a nickel deposit per can or bottle on non-carbonated beverages. It's a perfect day for a ride. Indigo sky, shining sun, barely perceptible breeze - just enough to cool you when you stop for a break. The view in every direction is breathtaking: ridgelines repeating to the horizon, the closest cloaked in green, further ones shading into blues. Inches away, patches of jewelweed froth up out of a shady ditch, like an impressionist painting with their dots of yellow and orange flowers, or phlox - white, pink, or lavender - lean over the guardrail, soaking up the sun. Suddenly, you're flying through a pool of fragrance from unseen blossoms, and from cool patches of woods, the clean scent of evergreens charges the air along the road. Your wheels whir on the pavement stretching away before you, drawing you toward a distant bend. But you probably don't have time to soak in the ambience, because on that pavement, as far as your eye can see, in the path of your spinning tires are discarded plastic water bottles, aluminum energy drink cans, and broken glass from somebody's tossed beer - an in-your-face symptom of social indifference as well as aesthetic insult and physical hazard. You can't risk taking your eyes off the asphalt for long. As people consume more bottled water and sports drinks - beverages that aren't carbonated and thus aren't eligible for New York State's current deposit/redemption program - beverage container litter has become endemic on the state's roadsides. If you've ridden in states that don't have bottle redemption legislation in force, you know it can be worse than it is here in New York. But it's more than bad enough here, and it could be better. The new NYS governor, Eliot Spitzer, wants to help by means of the "Bigger Better Bottle Bill," which would make bottled water, sports drinks, juice and other non-carbonated beverages subject to the 5-cent deposit. A mere 20 percent of non-deposit containers get recycled; 80 percent of deposit containers are redeemed and recycled. Expanding the redemption deposit beyond carbonated beverages like beer and soda would get many more beverage containers out of landfills, off our roadsides, and into products made with recycled materials. It's a win-win-win proposal. And while increasing the deposit to 10 cents per container is not on the table at this time, this rider thinks it's high time to increase the incentive for consumers to keep their containers in their vehicles until they get home, and to increase the reward for the folks who clean up the roadsides one bottle or can at a time - but that's a battle for another time. Right now, just getting the nickel deposit applied to non-carbonated beverages would be a huge help. There are of course opponents: the powerful lobbies of beverage bottlers and distributors, and the big-guns politicians who are influenced by them. So it's not enough that the Bigger Better Bottle Bill is a great idea; success depends on letting folks in Albany on both sides of the issue know how important cleaner, safer roadsides are to us: the people, the taxpayers. 2007 marks the 25th anniversary of New York's Returnable Container Act, better known as the "Bottle Bill." The bottle bill, which requires a 5-cent refundable deposit on beer and soda containers sold in New York, has been New York's most successful recycling and litter prevention program. Over the past 25 years more than 90 billion bottles and cans have been returned and recycled through the bottle bill. More than six million tons of plastic, glass and metal have been kept out of our landfills and incinerators. There is less litter and broken glass in our streets, parks, playgrounds and beaches, making them safer, cleaner, and more attractive. The bottle bill has worked hand in hand with local recycling programs to make our communities cleaner and healthier places to live. It's time to make New York's most successful litter prevention and recycling program even more effective. Because the bottle bill was enacted in 1982, before bottled water and sports drinks became popular, it did not include non-carbonated beverages. But today, it makes no sense for a bottle of sparkling water to be covered under the bottle bill but not plain bottled water. Governor Eliot Spitzer has been a longtime champion of updating the bottle bill. For the past two years, the New York State Assembly has passed this measure as a stand-alone bill, but it has died in the Senate, where Senate Majority Leader Joe Bruno has refused to allow it up for a vote. This year, Governor Spitzer has include the Bigger Better Bottle Bill as a cornerstone of his environmental budget. We all share responsibility for keeping our communities clean and healthy. But state legislators need to do their part. More than two billion bottles and cans end up in the trash or polluting our state's rivers, beaches and neighborhoods each year because of a loophole in our laws that the politicians in Albany have failed to close. It's time to pass the Bigger Better Bottle Bill! The Bigger Better Bottle Bill will prevent litter and make our communities cleaner: Litter surveys conducted by coastal cleanup volunteers found that two-thirds of the bottles and cans polluting New York's rivers and beaches are non-deposit containers, and these containers make up 20% of the total litter volume. The Bigger Better Bottle Bill will increase recycling and save tax-payers' dollars: Only 20% of non-deposit beverage containers end up in recycling bins. In contrast, 80% of deposit containers are recycled - 70% through the bottle bill, and another 10% through curbside programs. The bottle bill saves tax-payers' dollars by making beverage companies responsible for the waste they generate, rather than placing the burden on local governments. The Bigger Better Bottle Bill could generate more than $180 million a year to support the Environmental Protection Fund. Currently, beverage companies are keeping an estimated $85-$140 million a year in unclaimed deposits from bottles and cans that are not returned. New York is out of step with many other states, which require beverage companies to return unclaimed bottle deposits to benefit the public. WHO SUPPORTS THE BIGGER BETTER BOTTLE BILL?